The arrival of Bonnie Prince Charlie in Scotland. James II was defeated at the Battle of the Boyne in 1689. From there he had fled to France where his family lived in exile. Jacobites from that time forward giving their toast to the king passed their glasses and goblets over a jug or bowl of water to signify their loyalty lay with the ‘king over the water.’ The failed rebellion of 1715 had dashed many Jacobite hopes but now some thirty years later the bonnie prince arrived in the name of his father and immediately set about striking heroic poses. On that day in 1745 the inhabitants of Eriskay weren’t wildly enthusiastic to greet their Stuart monarch. MacDonald of Boisdale told Charlie to take himself home where upon, with commendable speed, the prince announced that he was home. It didn’t look good from the outset. He didn’t bring any French support with him and he’d been told that at most he could probably count on the loyalty of 4,000 Highlanders. There actually had been a planned invasion by the French the previous year but bad weather had prevented the enterprise. On the 25 July the prince and his followers sailed for and arrived in mainland Scotland. The Cameron Clan were persuaded to declare their loyalty and the vessel which had carried Charlie to Scotland was dispatched back to France with a letter to the Old Pretender stating that the prince was prepared to die amongst the Highlanders. It would be the 19th August before the royal standard of the Stuarts was raised drawing the Camerons, Macleods and Keppoch Macdonalds to its colours in the first instance. There were about 1,200 men. The rebellion had officially begun. Meanwhile in Edinburgh a wanted poster was drawn up with a price of £30,000 on Charles Edward Stuart’s head. The rebellion, for Bonnie Prince Charlie, would last slightly more than a year and it would see his army march beyond Derby spawning a plethora of blue plaques commemorating locations were he stayed or declared his father to be king as well as providing Sir Walter Scott with heady tales of love, honour and betrayal for the novels he wrote that made historical fiction a best seller. Charles II had balanced the political and religious beliefs of his subjects with all the acumen of an accomplished juggler. Yes he’d relied heavily on the financial largesse of his cousin the French king. Yes, he’d promised to convert to Catholicism at some point in the future (he was actually received into the Catholic church on his deathbed) and yes his queen Catherine of Braganza was Catholic but he didn’t alienate his people. By contrast brother James managed to irritate most of the population irrelevant of their religious beliefs mainly because he failed to learn from his father’s errors and tried to turn the clock back to a time when people did what the king told them to do. The final straw came in 1688 when James’s young bride Mary of Modena gave birth to a baby boy. Rumours swiftly spread that Mary had given birth to a stillborn child and that a healthy baby had been smuggled into the palace in a bedpan. Now – I don’t know about you but it would have to have been one heck of a bedpan or a very small baby for no one to spot the deception. In any event the arrival of baby James prompted the new arrival’s more mature brother-in-law, William of Orange, to kick James Senior off the throne. It’s always nice to encounter a close and loving family. Little James grew up in France at the chateau of St-Germain-en-Laye. 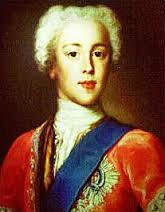 He was declared King James III of England and VIII of Scotland on his father’s death in 1701. His title was acclaimed by the Pope as well as Catholic Spain and France. Unfortunately Protestant England refused to play ball and even when King William died the country preferred James’ big sister Anne who was safely protestant though undesirably female – as we all know kings are better than queens except when they’re catholic or when they’re called Elizabeth Tudor. In 1708 James attempted to claim his kingdom. He decided the best bet was to invade Scotland where he would have been King James VIII (just in case you weren’t already confused enough). It was not a rip roaring success. James returned to Scotland for a second time following the Jacobite uprising in 1715 – a rebellion against the new king (George I) who was German, a little on the podgy side and who didn’t speak a word of English. His main qualification – you’ve got it- was the the fact that he was protestant. James had actually turned down the opportunity of getting the crown by invitation when he’d refused overtures which came with the proviso of converting to C of E.
By February 1716 James had left the country once again never to return. Sentimental types took to toasting the ‘king over the water’ – which sounds vaguely like some kind of Tolkienesque elf but that’s because my reading habits are far too eclectic.